Sometimes my brain is so full of ideas for new cards to make I can hardly choose which direction to head first. Other times (like this week!) I draw a blank and nothing I try seems to turn out at all. In times like this I like to turn to sketches/color palettes/theme challenges to get things kick-started. Today's card is a combo of a couple different challenge themes all rolled into one! 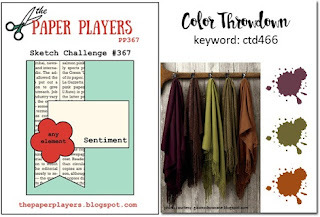 I chose the sketch from The Paper Players and the hues from the Color Throwdown. Since I like to "think outside the box," I made my burlap string do double duty as both the side banner and the small element in the sketch. These photos almost make it look like I used a dark blue, but I can assure you - that really is deep plum card-stock accenting my green and rust! I sure understand the mojo thing. About a year ago, my hands decided to just stop working. I always prided myself on details. Now I have to use things to create that are more forgiving. I love your work, and I am thrilled you stopped over to my blog. This is gorgeous, and I love the layered word die! I do the same when my Mojo goes on vacation... but it looks like you wrangled it back! Love this card, and you could use it for a variety of occasions. Thanks for linking up at SOS this week. Esther, this is a lovely autumn scene you have created. What a fabulous use of the colours and the layered up sentiment looks amazing. Glad you found your mojo and made this lovely card! Thanks for getting sketchy with the crew from SHOPPING OUR STASH this week! Beautiful fall forest and clever use of the twine for the sketch banner! Thanks for playing along over at The Paper Players this week! Beautiful inside and out, very clever! Thanks for sharing this with the Players this week! Esther I love the rustic feel of your fall card and those wonderful stamped trees. Thanks for joining us over at The Paper Players this week! Love the Autumn forest scene you created and yay for you, getting your mojo back with these challenges! Thanks for joining the fun at Shopping Our Stash! This is stunning, Esther. You are so creative. THanks so much for sharing this in our challenge. Gorgeous stamping and inking here. Thank you for your entry and hope you'll join us again in our current Challenge at Word Art Wednesday. Just want to leave you with God's Word in 1 Corinthians 3:10-11 which says, "By the grace God has given me (Paul), I laid a foundation as a wise builder, and someone else is building on it. But each one should build with care. 11 For no one can lay any foundation other than the one already laid, which is Jesus Christ." Enjoy the weekend.